Go To Team’s Baker crew was indeed “Ready for Some Football” monday night at Charlotte’s Bank of America Stadium. Though imposing in stature and and oozing with athletic prowess, the Charlotte based Baker crew left the pigskin to the Panthers and their helmets at home, opting instead to bring GTT’s Sony F900/3 onto the hang with NFL Network reporter Michelle Beisner, as she toured around the stadium, spoke with fans, and collected some of Charlotte’s best Steve Smith impersonations. It was a winning night for the Fans, for The Panthers, and especially for Go To Team’s Baker crew, who is always ready to hit the Sidelines at a moment’s notice. 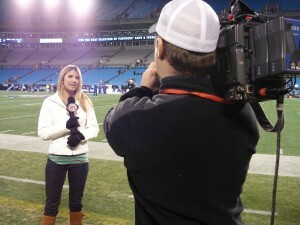 Keep an eye out for Michelle this Saturday on the NFL Network!